Cardinals safety Tony Jefferson celebrates his interception in the end zone. 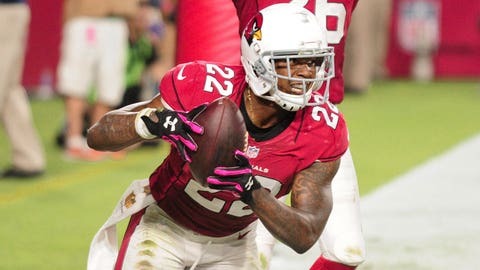 Tony Jefferson couldn't imagine feeling any better after making the deciding play in the Arizona Cardinals' victory over the Baltimore Ravens on Monday. Jefferson's interception in the end zone with six seconds to play snuffed out the Ravens' final hopes and wrapped up the victory for the Cardinals – a moment that left him feeling like a king. Jefferson was so eager to see if others shared his feelings that he jumped on Twitter while seated at his locker after the game to see how his game-saving interception was received on social media. “Got to go straight to the Twitter, man,” said Jefferson, who basked in the moment upon seeing he was trending on Twitter following his second career interception.